Oak wilt, and the precautions that need to be taken to help prevent the spread of this fungal disease, may be the most often talked-about aspect of tree health care in Texas. Throughout the state, tree owners and communities are challenged by the potential devastation to all species of oak tree. In some areas, there are ordinances in place that restrict oak trimming in order to prevent the spread of the disease. Other areas have no formal regulation, and this can lead to a lack of awareness and a potential for widespread infection. While oak wilt is a serious threat to our North Texas urban forest, there are simple steps that everyone can take to lessen its impact. What kind of Disease is oak wilt? Oak wilt is an infectious disease caused by a fungus (Bretziella fagacearum*). All oaks (genus Quercus) are susceptible to oak wilt, but different species may react differently to the fungus. Oak wilt is a vascular disease, and infects the whole tree, even if only one part is symptomatic. As the fungus spread through the tree, it blocks the transmission of nutrients to the canopy, causing the characteristic “wilt,” or dieback. In live oaks, infected leaves often show yellow-brown veins, even while still on the tree. In red oaks, leaves may simply wilt and brown. This process can lead to an autumn-like coloration during the summer. Additionally, fungal mats may form underneath the bark of red oaks, leading to cracking, peeling bark and a rotting smell. While visual inspection is a strong indicator of the presence of the oak wilt fungus, laboratory confirmation may be required. The Texas Plant Disease Diagnostic Laboratory offers testing for oak wilt and many other diseases. For more information on how to submit a sample, see this post or contact your arborist. How do trees get oak wilt? The most common ways for the oak wilt fungus to be transmitted are by insect activity and root grafting. Insects can infect a tree through any exposed wood (not covered by bark) or open wound (such as a pruning cut, broken limb, or where branches rub against each other). In situations with oaks planted in close proximity, the fungus can be transmitted from one tree to another via underground root grafting. As roots make contact with other roots, they grow together and share pathogens. Different species of oak can contract and spread oak wilt by different methods. Red oaks (Texas, Shumard, blackjack, water) are extremely susceptible to infection through insect activity. Red oaks are often the primary mode by which oak wilt gains a foothold in a new area. The oak wilt fungus thrives in red oaks and creates visible fungal mats underneath the bark. These spore mats attract insects; sap beetles of the Nitidulidae family are the most common type. Beetles feed in the infected area and become covered with particles from the spore mats. Drawn to exposed wood on healthy trees, the beetles transfer the fungal spores, spreading the infection. In contrast to red oaks, live oaks are susceptible to oak wilt primarily through their root systems. In nature, live oaks often grow in groups, sometimes called motts. Underneath the mott, the root systems of the individual trees become interconnected. This grafting allows not only nutrients to be shared, but pathogens as well. Once a member of the mott has contracted the oak wilt fungus, the infection quickly spreads. White oaks (post, bur, chinkapin) are more resistant to oak wilt than other species, but are still at risk. Transmission generally occurs through spore transfer by insects, or by human activity. Can you prevent Oak Wilt? Oak wilt is an epidemic. Because of the concentration and susceptibility of oaks in Texas, especially red oaks, it can be difficult to isolate centers of infection and prevent further spread. The Texas A&M Forest Service and the Forest Health Protection branch of the U.S. Department of Agriculture have issued some guidelines to help prevent further tree death. If you have healthy oak trees in an area with infected trees, preventative treatment may be effective in slowing transmission. As oak wilt is a systemic, vascular disease, the most effective treatments consist of injecting the infected trees with a fungicidal chemical. The only currently recommended fungicide is Alamo®, a formulation of the fungicide propiconazole. The fungicide is administered through holes drilled in the root flare of the infected tree and should only be applied by Texas Department of Agriculture Licensed Applicators. For large stands of oak trees, especially live oaks, trenching around the area and severing root connections can limit disease spread, as well. A typical system for fungicidal injection; each green port is inserted into the living tissue of the tree. Can you cure Oak Wilt? There is no known cure for oak wilt. Reported home remedies or substances applied to the exterior of the tree have not be proven to have any remedial effect. If you have a tree that is infected with oak wilt, be sure to consult a Texas Oak Wilt Qualified arborist or your local Texas A&M Agrilife Extension agent to discuss treatment options. Red oaks usually defoliate and die one to six months after becoming symptomatic. Live oaks may last up to a few years before total necrosis. White oaks show the most resistance to oak wilt and may survive several years after infection. Fungicidal treatment may prolong the life of infected trees, but cannot eradicate the disease. However, systemic fungicides are most effective if a tree has not lost more than 30% of the crown. Contact a certified arborist to see if your tree may be a good candidate for treatment. What areas have Oak Wilt? If you live in one of these areas, or suspect oak wilt activity in your neighborhood, contact your arborist to see what specific preventative steps are recommended for your trees. Oak wilt is one of the greatest threats to trees in Texas. Education, awareness, and prevention are the best tools we have to protect our urban forest from devastation. If you want to learn more about oak wilt, visit TexasOakWilt.org. 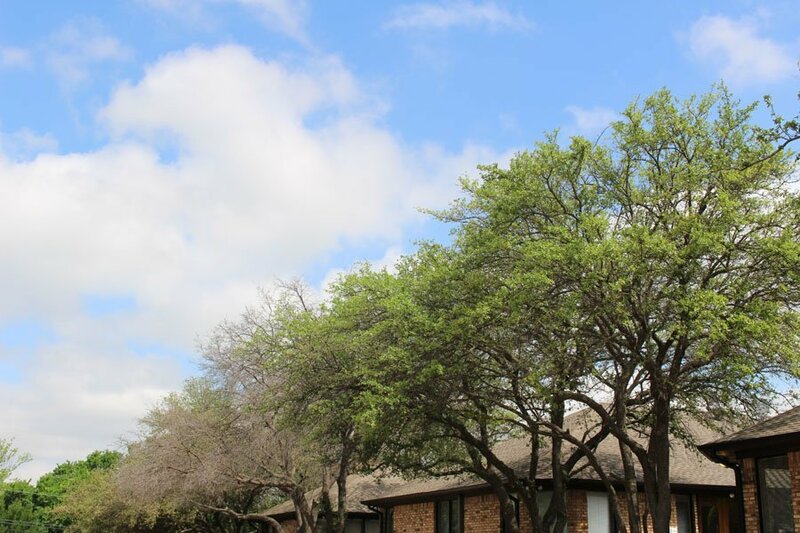 At Texas Tree Surgeons, we love trees and we love our customers, and we believe that the more people learn about their trees, the better we can serve our community. We have several Oak Wilt Qualified arborists on staff; please let us know if you have any questions about oak wilt or any other tree question. We are always happy to help! * – Until 2017, the oak wilt fungus was identified as Ceratocystis fagacearum.